In the whole “Sister City” world there may not be a better match on the planet. There’s the sleepy little town southeast of Portland called Boring, a quaint town as many in Oregon are. And then there’s the newly adopted sister city of Dull, Scotland, a good bit north of Edinburgh and 7,000 residents short of its new sister Boring. Yep, it sound like a match made in bad weather heaven, where gloomy skies are a way of life and the loudest thing in both villages is the quiet. With Oregon timber business in full decline over the last decade there’s not much left in the way of industry. Boring today is mostly a bedroom community for commuters making the Sunset Highway run into Portland each day. Dull (pronounced in the Scottish Gaelic dialect – dool) is mostly a farming community located in the county of Perth & Kinross. The village is a single street of houses on the north side of the valley of the River Tay. In the Gaelic language it means ‘meadow’. As heard today on NPR. This entry was posted in Living in America, Slider and tagged Dull & Boring, postaday2012, Sister Cities on April 26, 2012 by Mickey Mills. I love stories about people doing good work, about people being of service to people that can barely be of service to themselves. This is a story about Henry and millions of others like him. It’s a sad testament to what many of us have to look forward to assuming we have the fortune to live long lives. Or is it the misfortune? Henry is an Alzhiemers patient. He has been in this nursing home for ten years spending much of it in silence, relegated to his wheelchair and effectively dead to the world around him. He doesn’t recognize family. He doesn’t respond to simple questions. It’s a life I watched my mother getting ready for. Her early stages of the disease were a glimpse of a future I don’t want to see. It’s a terrible thing to watch someone at one time full of life and energy reduced to a struggle to contend with the most basic aspects of life. It’s insidious and medical science barely understands the mechanisms of the neurological aspects involved. So getting back to Henry. His caregivers tried everything to communicate. Henry was a shell without reply. Then one day someone wraps ear phones around his head, pushes the iPod play button, and music from his era begins to play. Almost instantly, Henry lights up. His eyes pop open wide, his body begins to rock side to side, back and forth. He sings in a language that maybe only he understands as the music transports him to another time. For a moment in time, he’s young again. Henry’s story is included in a new documentary film about the subject of reaching the unreachable through music. Alive Inside is a wonderful program film about the Music & Memory initiative, designed to bring healing through sound. They need your help. Give an iPod. I did. This entry was posted in Living in America, People, Slider and tagged Alive Inside, Give the gift of music, Henry Loves Music, Music and memory, postaday2012 on April 12, 2012 by Mickey Mills. George Orwell’s dystopian novel 1984 described the Government of Oceania, a country of perpetual war, around the clock government surveillance, and citizen mind control. It was a place watched over by Big Brother where you could be imprisoned for thought crimes. It’s a society of socialism where propaganda rules the airways and everyday is a lie. No right to privacy. It’s nearly 30 years beyond 1984. You might think in a free society such as the USA constant government monitoring an a total loss of personal freedom is not possible. A blog ran at MSNBC yesterday, a frightening report of privacy invasion and violation of our fundamental rights living in a free society. It is possibly an early volley in our journey to Oceania. It’s becoming common practice for employers and colleges to demand that applicants reveal their Social Media passwords during the interview process. In Maryland, applicants to the Department of Corrections are sat in front of a computer, told to access their Facebook account and allow the interviewer to look over their shoulder as they scan through wall postings, photos, videos and friend list. Before the ACLU filed a complaint last year the Maryland DOC was asking applicants for their user name and passwords so they could scan your account at their leisure. It seems the government isn’t letting something as simple as constitutional rights stand in the way of their thirst to invade your privacy. It’s amazing to me that any free thinking American would think for a minute this was acceptable. I’m not convinced it’s even legal. There is such a thing as the First Amendment, right to privacy and free speech. I’m going to be watching this one closely. The Patriot Act was just the beginning and the question is – where does it end? Before it’s over I could be at the Minitrue rewriting history with Winston Smith at my side. This entry was posted in Living in America, Opinion, Slider and tagged Facebook privacy, News, Opinion, postaday2012, right to privacy on March 7, 2012 by Mickey Mills. This seems like a very American thing to do. Your business is failing so what do you do. You start looking for way to cut costs. You look for ways to reduce payroll. You let people retire without replacing them. You look for operations that aren’t turning a profit and you cut them out like a cancer, forgetting what it might do to the patient. It’s a challenge facing our Postal Service and the Postmaster has laid out his plan for survival. For the customer it will mean worse service for a higher cost. In a plan right out of the General Motors playbook, the Postmaster General announced his five-year plan to rescue the Post Office. With red ink approaching 18 billion within three years nobody denies that something has to be done. But when you are talking about an institution as old as the USPS that is the glue that binds together rural America you can’t solve the problem with an ax. Delicate surgery is the name of the game. Reduce payroll through attrition, leaving jobs unfilled when postal workers quit or retire. Halt the prefunding of its pension fund, which is obligated to pay these retirees, and tap the funds already contributed to cover current operating costs. Remove older employees from the Post Office’s own health plan, and dump them into the taxpayer-funded Medicare system instead. Shutter as many as 3,800 rural post offices and mail processing facilities. It’s a tactic seemingly learned from the U.S. Airline industries. Cut services and charge more for it. That hasn’t worked out all the great for the sky jockeys flown right into bankruptcy court. I believe reducing services is not the way to go. If you reduce services you will have less peole using the them. I’m no math genius but I look at it like this. The post office brings in around $67 billion right now which equates to about a 27% ($18 billion) operating loss. Seems like taking the cost of a stamp from $0.45 to $0.60 would go a long way to solving the problem. I’d kick in my $0.15 to save the American institution Ben Franklin put in place. Neither snow nor rain nor heat nor gloom of night stays these couriers from the swift completion of their appointed rounds. Budget deficits… now that’s an entirely different matter all together. For more information regarding this government plan, visit – Save the Post Office. This entry was posted in Living in America, Slider and tagged Living in America, postaday2012, Save the Post Office, U.S. Post Office on February 27, 2012 by Mickey Mills. So here’s the story. Dennis Fleming of Farmington, NH, comes home to his 19th century farmhouse to find he has been burglarized. He spots 27 year-old Joseph Hebert, climbing out of a window at a neighbor’s home. Fleming shouted “Freeze!” before firing his gun into the ground, then held the would-be burglar at gunpoint until police arrived. No one was hurt, but when police arrived they arrested Fleming on a charge of reckless conduct, which could potentially land him a jail sentence equitable to what the burglar would get. Fleming is scheduled to be arraigned March 20. County Attorney Tom Velardi told Foster’s Daily Democrat he will review the case and determine if the charge against Fleming is appropriate under the state statutes regarding self-defense and defense of property. Fleming, meanwhile, is hoping to catch a break. Penny Dean, a spokeswoman for the Gun Owners of New Hampshire, said her organization is “absolutely outraged” by Fleming’s arrest. So, this guy did a service for his neighbor and the police by holding a criminal at bay waiting for local police to arrive. For his trouble he is arrested and now faces charges and the high cost of defending himself against those charges. It’s just another symptom of what’s wrong with government and the gun-control argument. I hope the District Attorney comes to his senses and drops these charges. Good luck seating a jury that would actually convict this grandfather of 14. This entry was posted in Living in America, Slider on February 22, 2012 by Mickey Mills. Oklahoma is still pretty much a wild west kind of place. There’s biker bars and honky-tonks around here where they check you for weapons at the door and if you don’t have one they give you one. This is the story of 18 year-old Sarah McKinley. On New Years Eve, McKinley was home alone with her 3 month old baby when intruders attempted to break into her Blanchard mobile home. Makes sense to me – two intruders, two guns, one very protective mother. This can’t have a good ending for the unsuspecting robbers. In Oklahoma the law allows deadly force against intruders. Standing outside her door trying to enter her home was 24 year-old Justin Martin and 29 year-old Dustin Stewart. Apparently they were on the prowl for prescription drugs and either didn’t consider McKinley a threat or didn’t know she was home. McKinley’s husband died on Christmas day from complications of lung cancer. When the men entered McKinley acted in self-defense and fatally shot Martin. Stewart fled the scene unaware of the scope of his situation. Prosecutors have arrested and charged the alleged accomplice with first-degree murder. Grady County Assistant District Attorney James Walters told The Oklahoman newspaper,”When you’re engaged in a crime such as first-degree burglary and a death results from the events of that crime, you’re subject to prosecution for it,” Walters said. Sounds like a big win for second amendment rights. This entry was posted in Living in America, Slider and tagged Crime, postaday2012, Second Amendment on January 5, 2012 by Mickey Mills. So Halloween has come and gone. The candy dish is intact and no tricks were played. We had one group of about a half dozen kids show up at the door. It barely put a dent in the candy dish. I remember Halloweens of my youth where children filled the streets in their homemade costumes. Which is another thing. What’s with the cheap store-bought costumes designed to the fad of the day? Of the few kids I did see out and about that’s all I saw. No one-eyed pirate patches with cardboard sword or ghosts with mama’s sheets. There were Transformers and Iron Men, Princesses and Dancers, Batmen and Witches… and every flavor of Zombie imaginable; no cowboys or Indians. I wonder if that’s because we live in Indian country? 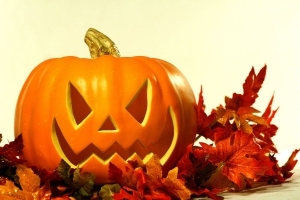 This entry was posted in Holidays, Living in America and tagged Halloween, Halloween costumes, postaday2011 on November 1, 2011 by Mickey Mills. Last week a North Carolina man walked into a branch of the RB&C Bank in Gastonia intent on robbery. James Verone is not your typical bank robber. He was not armed. He didn’t wear a mask. He did have a note asking for $1.00. After getting the dollar he told the teller he would be waiting in the chair by the door. Serve 3 years for bank robbery. Get out at age 62 and file for Social Security. Move to Myrtle Beach and work on tan. In some ways you have to admire his willingness to work the system. They make movies about guys like this. The story behind this story is the one that really grabs me. We can put a man on the moon. We are the richest country on the planet. We arguably have the best colleges and universities putting out the brightest and the best. And we can’t figure out how to get health care for the needy. Between the greedy insurance underwriters, lawyers and drug companies, we have created a medical behemoth that is strictly for the haves — the have nots be damned. There might also be a fly in Mr. Verone’s ointment. Because he only took a dollar hs is not being charged with bank robbery, only larceny, so his sentence may fall way short of three years. Guess he might have to misbehave and hope for a tack on. This entry was posted in Health, Living in America and tagged Bank Robbery, Crime, Health, Health Care, News, postaday2011 on June 20, 2011 by Mickey Mills. In the never-ending march of National fill-in-the-blank Days this one ranks right up there as one of my absolute favorites. My love affair with the circular treat goes back to childhood when my first paying job was selling Krispy Kreme doughnuts door-to-door and hotels in Myrtle Beach. We were all a little naive in our youthful enthusiasm. I mean who really wants 15 year olds banging on their hotel room door at nine in the morning to sell doughnuts. The Salvation Army in Chicago instituted National Doughnut Day in 1938 to celebrate the women who served doughnuts to American soldiers during World War I. The Salvation Army’s “doughnut lassies” did not skip a beat and continued their service during the second World War and the doughnut was officially cemented in the American diet. The Salvation Army is providing their original recipe if you would like to replicate the WWI doughnut. If you’re not in the mood to celebrate National Doughnut Day in the kitchen, try heading down to your local Krispy Kreme or Dunkin Donuts. Krispy Kreme is offering a free doughnut to all customers at participating locations. 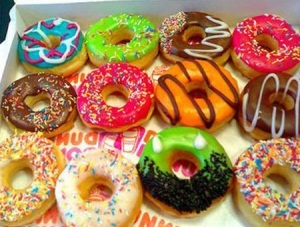 At participating Dunkin Donuts, customers will get a free doughnut with the purchase of a beverage. This entry was posted in Holidays, Living in America and tagged Doughnuts, Food, postaday2011 on June 3, 2011 by Mickey Mills.